If you are a golfer, chances are you wouldn't want to be in the clubhouse nursing a bad back, aching elbow or sore feet! You want to get back in the game without a handicap! That's why at Keyes To Health our goal is to get you moving and keep you moving! According to the Canadian and US PGA, back and foot pain are among the most frequent disabling complaints among golfers. Foot pain among golfers is common due to many factors in the game of golf. Walking on uneven terrain, the rotational effect of the golf swing, miles of walking all contribute to an over-use situation which can affect the feet. Common foot issues include plantar facilities (heel pain), arch pain, metatarsalgia (fore foot pain) and knee pain. Providing proper support with foot orthotics can go a long way toward eliminate most foot discomfort. Foot stability is the basis of a great golf swing. Custom foot orthotics provide a more stable platform for the feet and can improve your golf swing. It is important to note, however, the USGA does not allow you to "create a stance" by altering the shoe or using an insert which is designed to specifically affect the golfer's swing. Your custom orthotics from Keyes To Health. are designed to minimize the biomechanical faults of your feet. Once you're in the swing of things, don't let a golfer's elbow or lower back pain due to the mechanics of a rogue swing set you back. Massage Therapy has been known to ease the tension of the muscles surrounding your spine that put your swing in action. Treating Golfer's Elbow (medial epicondylitis) is a breeze with frictions and stretches to the common flexor tendon of the forearm, and shoulder. These modalities, offered by our Massage Therapists at Keyes to Health, will keep you from buying the pro-shop solutions, and will help you to get back to your game and improve your score. 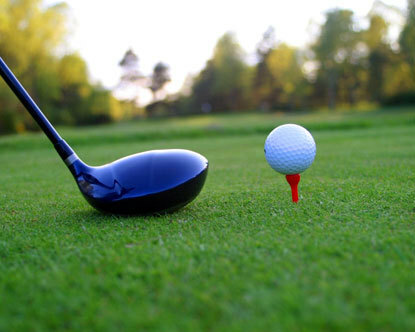 I have put together some great tips and information about golf injuries and golf orthotics. Back injuries are the number one cause of missed golf games. Please Click here to find out how you can get back on the green without pain, walk the course and improve your playing performance! The EagleFlex (manufactured by The Orthotic Group in Ontario), is a suitable orthotic for golfers who require biomechanical balance during their golf swing, as well as comfort and support while walking the golf course. To learn more about orthotics and how they can help you, please click here.